Everyone around me seems to be busy these days. Elizabeth is up to something strange in her room. She’s making things out of string. She uses long pointy sticks. I’ve watched her. She just keeps turning the work round and round and it slowly forms human fur that hangs further and further from the sticks. It’s boring to watch. But there’s nothing else to do…. Both Kay and Elizabeth take me for walks and rides every day. That’s nice. There aren’t any animals coming round to speak of; the snow’s too deep for them to run fast, so they’re keeping away from me. Just as well. I’m feeling a lot better, but I’m not as full of energy as usual. I get tired fast moving through the snow, too. It’s up to my chin when I get off a path! But on Monday, something interesting happened. Kay took me for a ride down the big gravel path to the box where the two-leggers find paper with strange markings on it. This paper is folded up and stuffed into another paper that’s made to hold it. Wolves howl to communicate with one another across the miles. Two-leggers send these papers to one another. They call it mail. Sometimes books come in the mail for Elizabeth, and they’re too big for the box down the big gravel path, so we go to a building in town very near Doyle the Dog Food Man’s store, so there are always lots of dogs out for walks in the area. I like trips to the mail building…. Monday was one of those days when Kay had to go in for bigger mail. She went into the mail building, then she came out with a big box. I wondered at her carrying it because, really, if it was full of books it would’ve been too heavy for her. She put it in the back of the car and I got a chance to sniff it. Whoa-ho-ho! Did it smell interesting. Definitely not books! I stuck really close to Kay on the way into the house. I was sure something would jump out of that box. Definitely animal! The box was for Elizabeth. She saw Kay carrying it and went out to get it from her. When she got it inside, she put it on the floor and went for a knife to open it up. By the time she found one, I’d pushed the box across the floor sniffing it. I thought maybe we’d be wiser opening it outside…. Elizabeth cut open the top of the box. Nothing jumped out! What is that in there? She pulled a bag out of the box and set it on the floor. I sniffed it carefully and examined it very closely. What on earth does she want a bunch of sheep’s wool for when she’s got . . . ME? BOL! Thanks, Boomdeeadda. I need all the moral support I can get around here! BOL! It’s almost the same colour as you, Stella! I think that’s probably a compliment. I think she’s going to make something to wear with it, so that she looks as much like you as she possibly can. I just don’t know what to say. Elizabeth is only just now able to type my response. She’s been doubled up with laughter…. 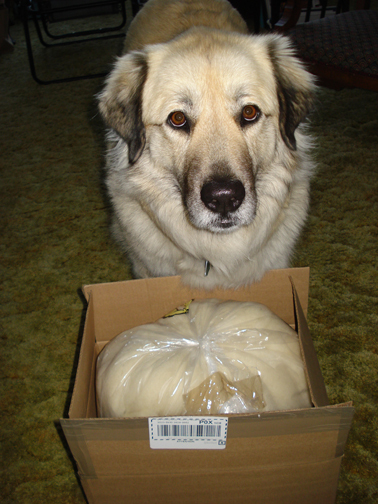 She says that’s what she’s saving MY wool for…. Oh, I expect she says we have to be patient and wait and see. I hate being patient! OH Dog! I was hoping for cookies! What is the sheep’s whool for?! I’m inclined to agree, Basil. 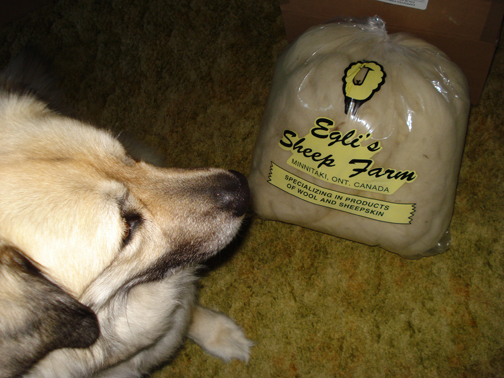 Maybe Elizabeth is planning to make a mouse out of the sheep’s fur. That’s what my two-legger does after she brushes me. By the time she’s finished, she has a handful of my fur that she rolls up into a grey oval (my black and white fur mixes together to make a grey colour). Then, she twists one end to make a long thin tail. We have lots of fun afterwards when she throws it for me to catch. Sometimes, I can catch it before it touches the ground. 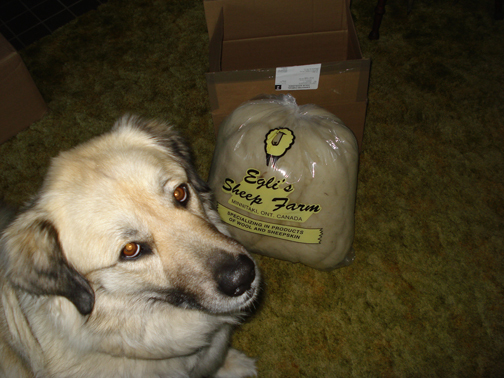 You might find this sheep’s fur or wool or whatever you call it will make something fun for you to play with, too, Stella!